In Aruba, like anywhere else in the world, everyone (or at least, a lot of health conscious people, organic consumers and Non-GMO supporters) is raving about it: Quinoa. After I first read about this edible seed called “The Mother Grain”, I ended up asking around for ‘Key-Know-Whah’ like a clueless person, which is exactly how I (and I’m not alone on this) started out. Soon enough, someone with much more savoir-faire on the matter, presented me with a surprisingly delicious introductory bite together with its correct pronunciation: /kin’wa/. Homemade Quinoa Mushroom Burger with Sweet Potato Fries and Avocado Salsa, Grilled Pineapple and Cherry Tomato Sate! In a nutshell, - or should I say, in a seed coat? - Quinoa is a “superfood” (low in calories, high in nutrients) that not only contains a load of proteins, fiber, vitamins, minerals and antioxidants. This beloved grain is also gluten free, easy to incorporate into any diet and - let’s not forget - very tasty. 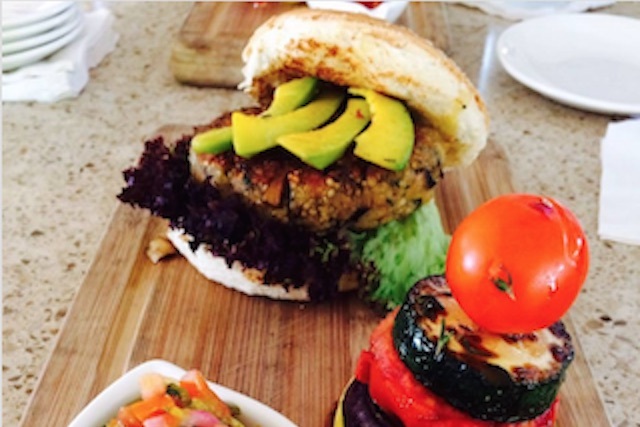 At the Manchebo Beach Resort & Spa, guests and locals can savor a variety of nutritional delicacies for breakfast, lunch, dinner or snacking, including Quinoa dishes like burgers and who knows, maybe they’ll add porridge after reading this post, I hope. I’m sure gonna try it, if they do. I’ve already committed myself publicly. 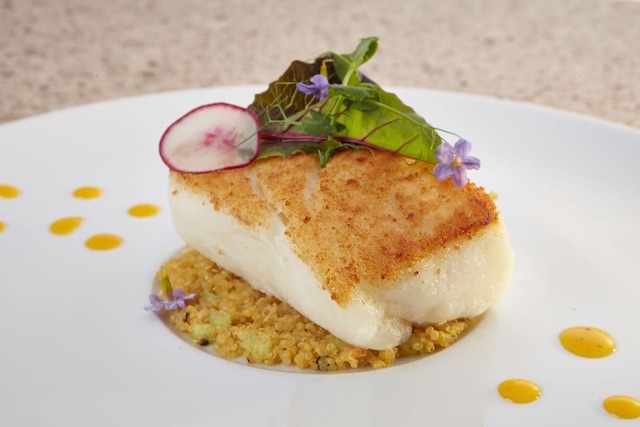 For a more thorough indulgence in wholesome dining experiences, Ike’s Bistro offers a succulent menu with an equally enjoyable setting to match. Start with Italian Octopus A La Griglia to get a taste of red quinoa, fresh citrus and herbs with squid-ink aioli to shake up those taste buds. Hopefully, I’ve got you all excited about this simple yet savory meal, substitute or side dish option. Add quinoa to a fine mesh stainer and rinse well before using in this recipe. Add water and quinoa to a saucepan. Cover and bring to a boil. Reduce heat to low, and simmer for 15 minutes. Once complete, remove from the stove, remove lid and allow to cool for a couple of minutes. Meanwhile, preheat oven to 350F and line a baking sheet with parchment paper or a silicon baking mat. Set aside. Add flour, sugar, ground flax, pumpkin spice mix and salt to a large bowl. Then, measure 1½ cups of the cooked quinoa and add to the dry ingredients. Stir to coat, until all quinoa granules are covered in the mixture. Set aside. Add pumpkin, oil, vanilla, egg white and maple syrup to a small bowl and stir well. Pour the wet mixture in with the dry mixture and stir to combine. One tablespoon at a time, scoop mixture onto prepared baking sheet, leaving a small space between each cookie. They will not spread out, so you can keep the cookies close. Lightly form each cookie, as you’d like them to come out. I flattened them slightly between my palms. Bake in the preheated oven for 25-30 minutes, until cooked through and golden. Remove from the oven, let cool on the pan for 10 minutes before transferring to a cooling rack and allowing them to cool for a couple of hours. Because cooked quinoa was used in this recipe, the longer you leave it to cool, the firmer your cookies will become. Leave them be and they will transform! When ready to serve, top each with a teaspoon of whipped cream if desired. Cookies can be stored in the fridge for up to 2 weeks. - To make these quinoa cookies gluten-free, use gluten-free all-purpose flour like this. - Coconut sugar could likely be replaced with any other type of sugar that you have on hand. - Grape seed oil works well for this recipe, but any oil will do the trick! - To make these quinoa cookies dairy-free, you could use coconut cream for the topping instead of whipped cream.